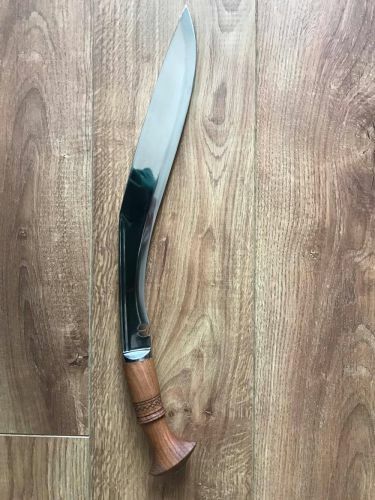 Tora's Sherpa Sirupate is a "Villager" styled kukri which comes with a 39cm long blade, belly depth of 4.5cm and handle length of 13cm. It has a stick tang. The Karda supplied with the Sherpa Sirupate comes with an 11cm blade, and an 8cm long handle. A traditional Chakmak is also supplied. The scabbard comes with frogs and a tinder pouch. The rough weight guidance for the Sherpa Sirupate is 575-650g.